One of my simple pleasures in my reading life is getting to jump into a Harlan Coben novel and lose myself in the worlds he has created. 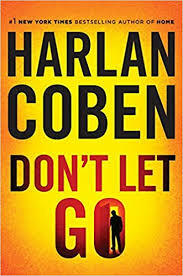 While I enjoy all his books, his latest, Don’t Let Go, has Coben at his finest. He has created a mystery that will keep you captivated throughout with a few red herrings to keep you guessing until the very end. Nap Dumas is a detective who has a rough past … a brother who was killed in a train accident while drunk, a long-lost love who left him days after his brother died and has remained a ghost for the past 15 years, and a life filled with regret for what he lost long ago. When he receives word his long-lost, but never forgotten love, Maura, has been tied to the recent murder of a police officer, he begins an investigation which will bring long buried secrets to the surface. His investigation brings him face-to-face with events from the past; both ones he needs to look further into and ones he may just be better off forgetting. The beauty of Coben’s writing is in the manner he imbeds small hints and clues that will blossom later in the book; phone calls which go to voicemails which are listened to later on and contain big revelations, conversations which take on new meaning as the story picks up steam, and plot lines which appear innocent but take on a sinister feeling when revisited and viewed through a more educated lens. This book is classic Coben, fun, entertaining, and hard to put down. While not the standard fare of many Gutter readers, it is well-worth the time you invest in it.